Pinterest, in a nutshell, is a platform, where users create boards and save items of interest as Pins to their created boards. Since its launch in 2010, it’s grown to over 100 million monthly active users. This platform’s particular demographic just so happens to be one of the wealthiest in the world. Women will have an estimated global spending of about $18 trillion in 2018. It’s obvious why businesses need to be active on this platform – people can literally buy your products or services right from the app. Let’s review some Pinterest basics before we dive into how to set up a Pinterest Ad. 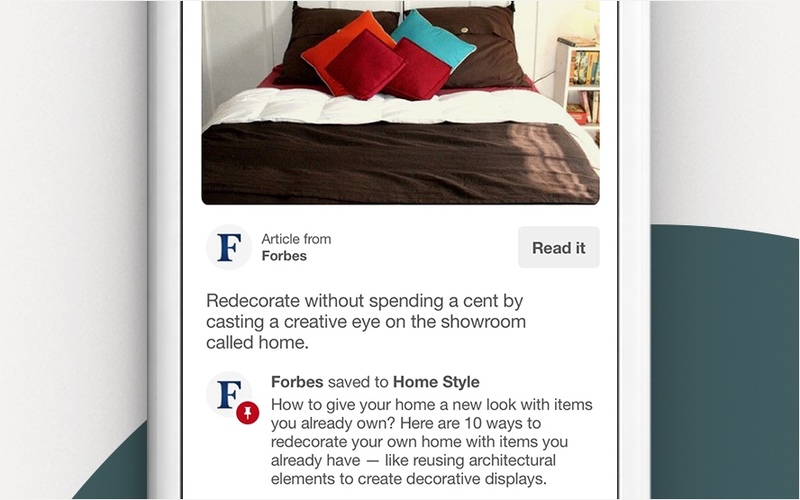 Pin: According to Pinterest, Pins are visual bookmarks that you collect on boards. You can save Pins you find on Pinterest or add new ones from your favorite websites. Board: Boards are where users collect their Pins. Users can keep Pins based on areas of interest, use Pins to make plans (like for a vacation), set goals or take notes (like recipes, etc.). There’s lots of opportunities for your business board to help your followers. Maybe you share pieces of your blog content with quality images and organize them by topic (marketing or sales, etc). Or maybe a kitchen supply company could offer recipes organized by type of food. 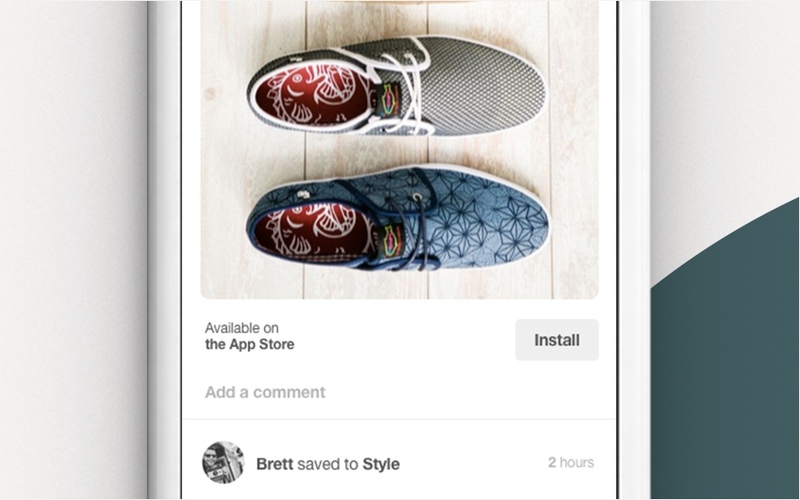 Promoted Pin: A Promoted Pin is Pinterest’s version of an ad. You can target users based on demographics like age or gender, their location or device. You’re charged just like a regular cost-per-click (CPC) ad. Now that we’ve got the basics covered, let’s take a look at how you can create a business account and start taking advantage of all that Pinterest can do for your business. 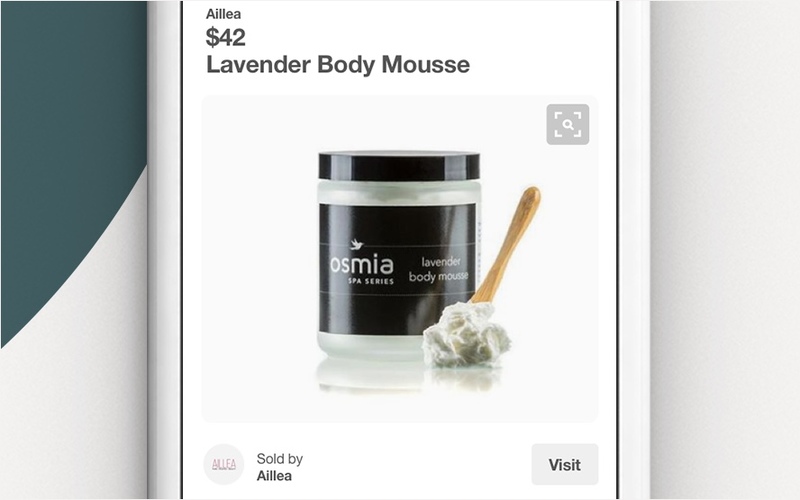 There are several ways of advertising on Pinterest. We’ll cover each one in this section and then give you a step-by-step of how to set up your first ad. A Promoted Pin is just like a regular pin, except you can pay to have it promoted and seen by more people. One huge benefit of Promoted Pins is that, when someone shares it on their board, that “Promoted” mark goes away. Your Promoted Pin essentially becomes an organic Pin once someone else shares it on their board. Plus, the extra views your post receives from being posted on the sharer’s board won’t cost you anything. Promoted Video Pins are simply Pins that feature a video instead of an image. They play automatically when viewed from a user’s feed. When users click on regular Pins, they are shown a “close up” image with more details. But, with One-tap Pins, when users click on your promotion, they’re taken to a website or landing page that you set up. This is a great way to increase web traffic or drive users to purchase pages for your products. • Use similarly styled images – you can feature more images of your product on your website, but make sure they’ve got a similar feel: lighting, coloring, filters, etc. Your goal is to make your ad and webpage look seamless – the same company and brand – so that your prospects will trust they’re viewing the same brand when they’re on your product page. Promoted App Pins are great for developers or app companies that want to drive ad traffic to download an app. Instead of directing users to a website, Promoted App Pins open up your app for download in the Apple or Android store. Cinematic Pins are similar to Video Pins because they’re moving pictures. But, Cinematic Pins only move when users scroll past them in their feed – they stop moving when users stop scrolling. 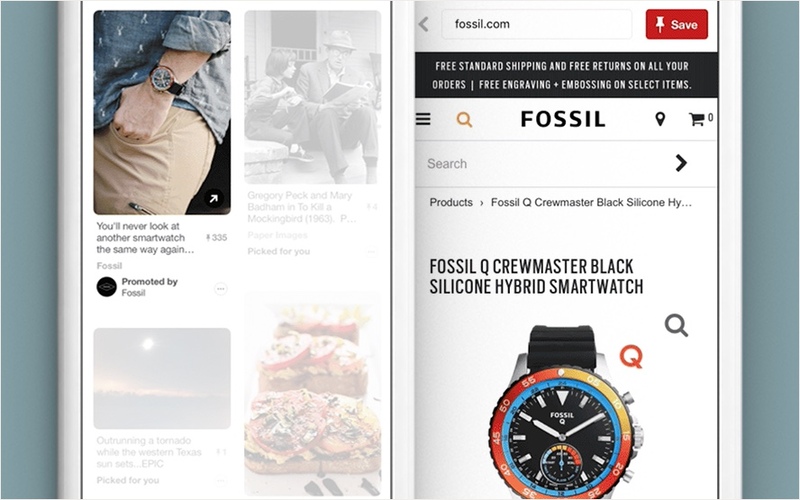 Just like Facebook, Instagram, or Snapchat, Pinterest also offers a website tracking Pixel. This snippet of code will allow you to fine-tune your Pinterest Ads audience and zone in on your followers’ demographics a bit better. The way it works is that a developer can add this code into the appropriate place on your website. You can do this if you feel comfortable accessing your site’s code or metadata. Once the snippet is in the backend of your site, it will collect data about your website visitor behavior. 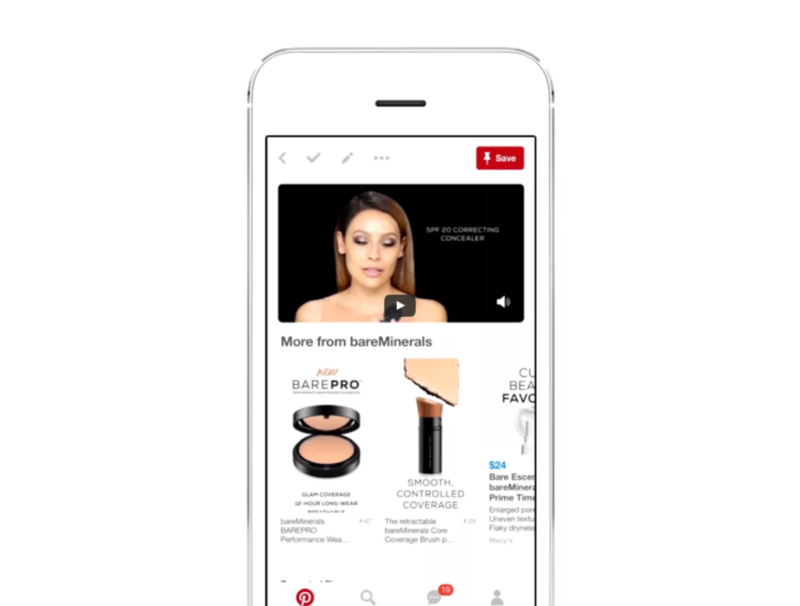 You’ll also be able to show your Pinterest Ads to people that have viewed your website. Pinterest occasionally changes the types of Rich Pins offered and you can find a step-by-step of how to install each type here. The goal of each of these types of Pins is to entice users to click through to your product page, website, blog or any page you want them to visit and take action on. Rich pins can be promoted just like an ad or you can simply post organic rich pins. Either way – they’re extremely useful as they provide your followers with more information about your product or service directly on the Pin. Product Pins: these Pins are perfect for featuring a product because they give the user relevant buying information right on the Pin, including price and where to buy. These Pins are great for directing traffic to your product purchase pages. Article Pins: These Pins showcase blurbs about a blog post or story that you share. These are great for directing traffic to your blog or publication. When you’re setting up an Article Pin, make sure you write compelling blurb copy like the following Forbes ad. A blurb should be a quick sentence that entices users to click-over to read the full article. App Install Pins: These Pins allow users to download your app directly from the App Store or Play Store. This is beneficial for anyone selling a new mobile game or application. This Rich Pin is similar to an App Install ad – the difference being that your users will get a bit more information directly on the Pin, and also, you can opt to run this type of Rich Pin organically. 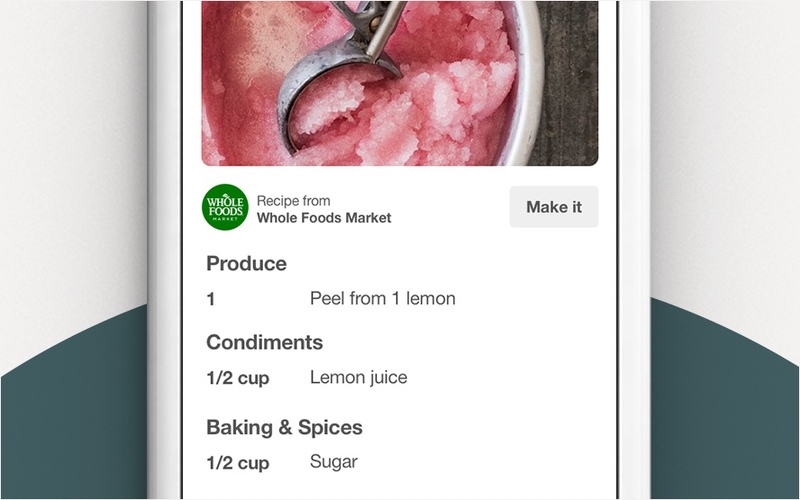 Recipe Pins: This type of Rich Pin displays ingredients and cook time – so that people can follow along right from your post. Once you’ve got the code embedded in your site, you’re ready to post Rich Pins. Note that you need to install the proper snippet for each specific type of Rich Pin (recipes have a specific snippet, as do app installs, etc.). You’ll likely need the help of your web developer to help you post your Rich Pins. The process is pretty technical. You’ll find installation details for developers here. Even though this type of Pin requires a little tech expertise, you should take advantage of them. If you don’t have an in-house developer and you’re on a budget, try Upwork to find a WordPress developer or Shopify developer – there are tons of them out there and a one-off project is much more affordable than a full-time developer. Now that you know what kinds of Pinterest advertising formats are available, let’s get your business set up to use Pinterest ads. To create an ad, first, you need to sign up for a business account. This step is important because you need a business account to create advertisements and access critical analytic data. Before we start creating your first ad, it’s important to note that ads are based on Pins that you’ve already created. 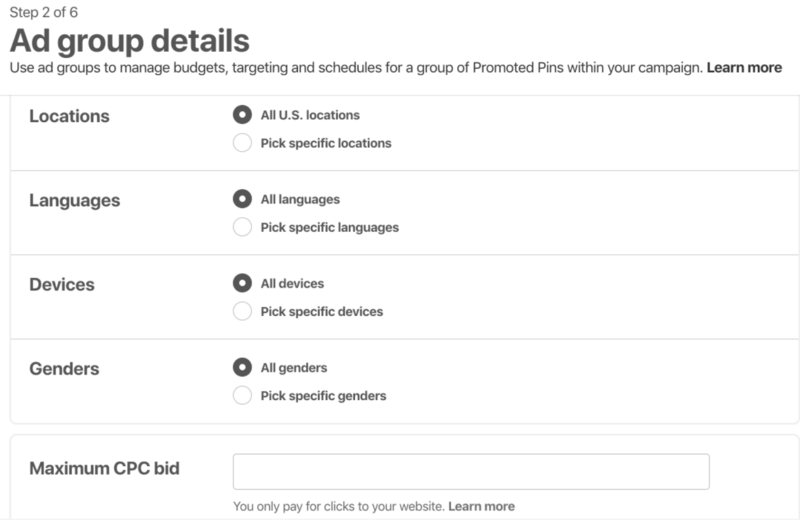 So first, you’ll need to create the Pin that you want to promote as an ad. Next, you need to go to the business ads homepage. From there, you’ll click on the Ads tab > Create ad at the top left. Next, you’ll see the ads dashboard. From here, you’ll select which type of ad you want to run. 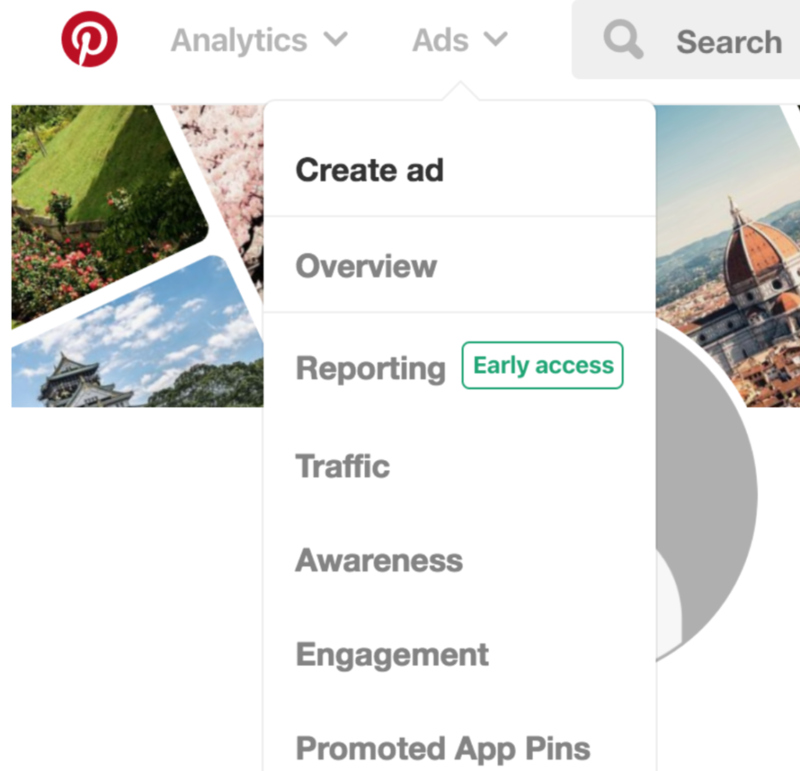 As you can see, there are two categories for Pinterest Ads: Build awareness and Drive consideration. Brand awareness: These are great for displaying products and services. Or showcasing something new about your business. Anything that you want your users to become familiar with. Video views: This type of ad is for generating as many views of your shared video Pin as possible. Again, the goal is to familiarize users with your brand. The other type of Pinterest Ad category is consideration – which means you want your users to see your ad and then take an action. Actions can include clicking over to your website or product pages. Traffic: This ad type is what you want to use if your goal is to drive traffic to a particular website, landing page, blog post or product page. App install: If you’re trying to sell your mobile game or application, you’d select this ad type as it allows users to click through to the App or Play store. 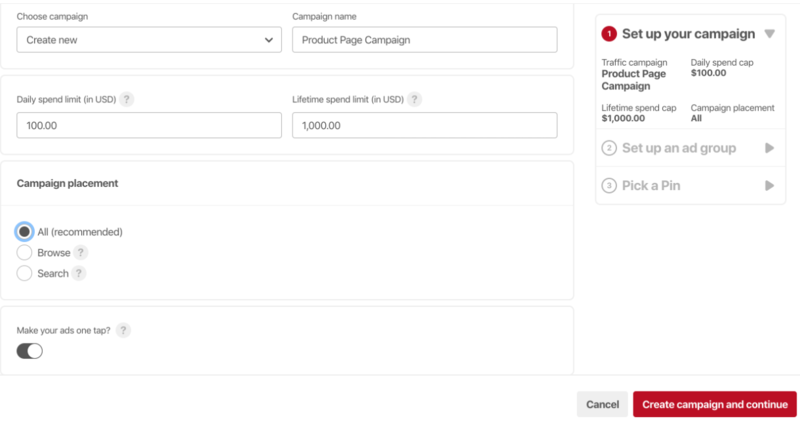 Next, scroll down so that you can fill in the campaign name and set a budget. Next, you’ll need to select the placement you want. Next, you should turn on one tap. This means that users will only need to tap a Pin once to land on your website or app download page. Without this, when users tap your Pin once, they’ll see a “close up” version which displays more information but does not automatically direct them to your site. One tap increases click-through traffic by nearly 300%. Click continue at the bottom right. Next, you’ll be asked to enter an ad group name, schedule, and budget. The group name is an umbrella name – where you can build lots of ads under one umbrella. Example: You might want to have a group name for your women’s shoe campaigns – you name your group “Women’s Shoes.”. Within that group, you could have different ads for different products: This Style Shoe, That Style Shoe, etc (these are the individual ad names you set at the beginning of the ad creation process). Now it’s time to choose an audience. Audience simply means the people that your ads are displayed to. We’ve talked a lot about how to build great audiences based on customer personas – so learn more here. You want your ad audience to be pretty specific and fine-tuned without being too small. Once you choose your ad type, you’ll be prompted to name your audience and describe them. The name could be specific to the product your advertising like women’s running shoes, or it might be a demographic like, women ages 20-34. If you don’t want to use the Pinterest Tag options or engagement metrics listed above to build your audience, you can build an audience based on interests and demographics. 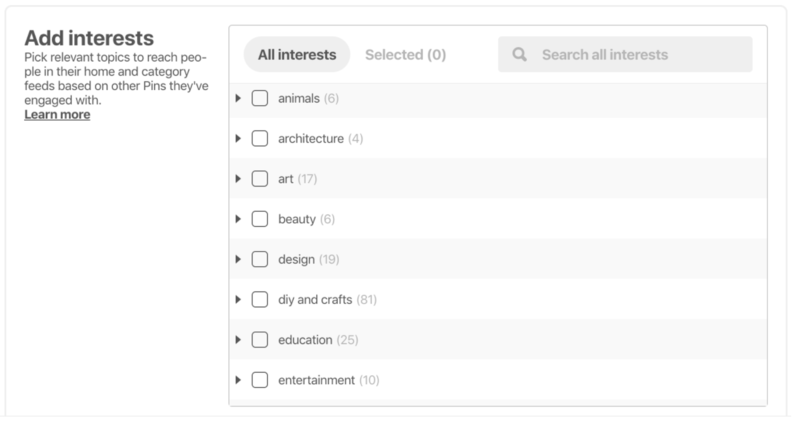 Pinterest will give you the option to select from a giant list of interests; you just check off the ones you’d like to apply. 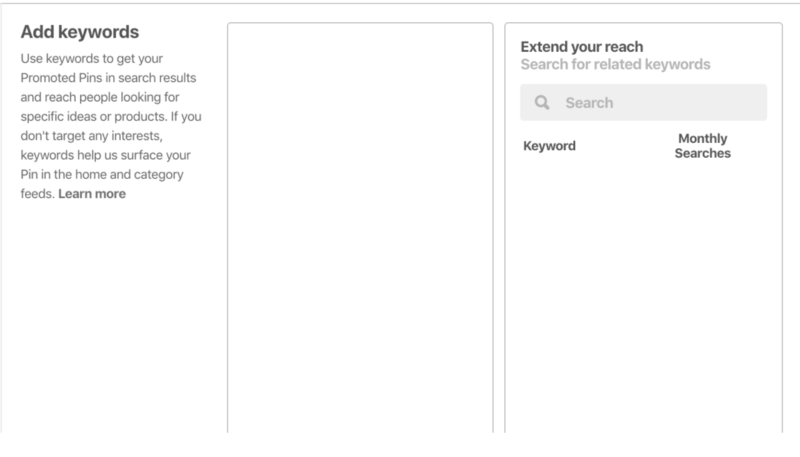 From there, you’ll be prompted to enter any keywords you’d like to target. For example, we might enter “women’s running shoes” if we’re looking to target users who are searching for that term. You should include as many relevant terms to your ad as possible – the more keywords you add – the higher the likelihood that searchers will land on your ad. Finally, you’ll select demographics and a minimum CPC bid (how much you’re willing to pay for a click). Next, you’ll be prompted to select the Pin that you want to advertise. Finally, you’ll enter the destination URL for your product and click, “Promote Pin” to launch your campaign. It will take about 24 hours for Pinterest to approve your ad. You’ll also give them your billing details so that they can charge your account based on the budgets you’ve set for your campaign. You can’t improve what you don’t measure. To make the most out of your Pinterest Ad dollars, you need to put your money into the ads that are working best. Let’s go over a few things that will improve your conversions and ad performance. Images are the heart of Pinterest. Without good images – you’re not going to be satisfied with the performance. • Make sure your photos are professional and original. Don’t use stock photography. If you’re not much of a photographer, hire one who can help you take pictures of your product(s). • Use photos that showcase people using your product. Some studies show that people prefer clicking on images that show a product in use. • Make sure your images are the right size: 600 x 900 pixels. • Use keywords in your image description so that your Pin shows up when a user searches your keyword. You can use Pinterest’s analytics to find what’s working best for your brand. 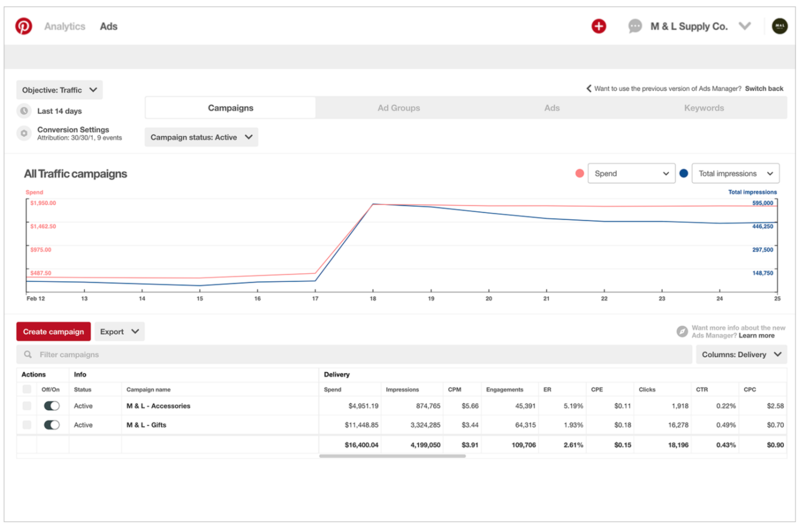 • Visit your ad analytics dashboard by clicking Ads at the top left, then Campaigns. • Use the dashboard to get a quick glimpse of which ads are performing best, or if any aren’t performing well. Focus your spend on what’s working. You can also make use of your best organic posts as Pinterest Ads. • Check out your dashboard to see which Pins have the most engagement. To view your analytics click Analytics > Overview in the top left corner. • Notice which Pins have the most shares and engagement. If any stand out as great performers, you can set up an ad campaign around that particular Pin since you know your users are more likely to interact with it. If you’re just getting started with Pinterest and Pinterest advertising, then you’ll want to embed the Pinterest Tag in your website and also take advantage of Rich Pins. Doing this will provide you with a wealth of information on your users. With this extra knowledge, you’ll be able to improve your ads. • Use Pinterest Tag to retarget users that have visited your website. • Build a lookalike audience for your Rich Pins based on people that have viewed the product buying pages on your website. • Direct people that have engaged with your Pins in the past to your product page or website. There are so many benefits to being active on Pinterest. Users can buy your products directly within the app. You can promote your products in incredibly engaging ways to one of the world’s most sought-after demographics: millennial women. You should be sure to take advantage of Pinterest Tag and Rich Pins with the help of a developer as this can dramatically improve conversions. What are your best tips for advertising on Pinterest?